It’s not every day that Alice Waters calls and asks to chat. Naturally, I jumped at the chance. There’s a special place on my cookbook shelf for the quietly reassuring, resoundingly reliable cookbooks penned by Ms. Waters. (She seems more of a Ms. than an Alice, don’t you think?) Her philosophy of simple food done well has always resonated with me, as it has for countless others. Have you ever read her strangely soothing botanical discussion of mandarins, or, for that matter, her treatise on just about anything? Have you tried the accompanying suggestion for sliced satsumas with lavender and honey? If not, I suggest you remedy that. But I digress. I sort of stumbled over myself when preparing. I was told that I was free to ask any questions I liked. That anything food is game. Being just a little nervous—this was Alice Waters, after all—I flipped through In the Green Kitchen once again, just to be safe. The book essentially teaches the art of simple cooking, something that Ms. Waters has quietly, determinedly, successfully been doing for longer than many contemporary food revolutionaries have been alive. Interestingly, with each book she seems to further simplify the art of teaching cooking. Yet the recipes are no less compelling than in the past, and the writing, as always, is quietly evocative and eloquent in a spare sort of way. Despite its title and the introduction’s insurrectionist-sounding “Green Kitchen Manifesto,” the slender tome is less about doing right by the environment than it is about simply doing right by the proper cooking techniques—although in her book, the two go quite contentedly hand in hand. It’s sort of the continuing adult education edition of her Edible Schoolyard project. In the Green Kitchen essentially profiles 29 friends and cooks of Ms. Waters, along with the specific, simple, and arguably infallible approach they rely on for a particular technique. Poppy Tooker on cooking rice. David Tanis on simmering beans. Clodagh McKenna on putting leftover bread to good use. Dan Barber on steaming vegetables. David Chang on pickling vegetables. There’s even an online companion to the book, The Green Kitchen, which is something of a mini culinary-minded TED conference, with cooking snippets from many of the book’s characters. Ten minutes may be ample time to dress a salad, whisk a mayonnaise, knead dough, sear a steak, or chat up a local farmer at the greenmarket. But it’s not at all sufficient time to inquire about everything I’d ever wanted to know of Ms. Waters, not with someone who speaks with as much passion, conviction and thoughtfulness as she. So little time, so many questions. Still, we managed to cover quite a lot. The transcript and her insights are below. If, like us, you have lingering queries, you can arrange your own interview with Ms. Waters—sort of. Join in this Wednesday when she hosts a webinar in which she’ll share techniques from the book that will help empower all manner of home cooks. Just log on Webex at 1 p.m. EST. That’s this Wednesday, the day before Earth Day. Not surprisingly, it seems Ms. Waters is still a little ahead of the rest of us. RSR: Ms. Waters, you’ve taken great care to explain, time and again, that working with food on a regular basis breeds familiarity. That all it takes for the home cook to become comfortable with any technique is to do it two, three or four times, at which point they sort of memorize it. That there are basic elements of cooking which, if pursued almost daily, can coax the home cook into improvising without even thinking. Yet familiarity can also cause some of us to fall into ruts. Could you share one or two things that you feel could help save home cooks a tremendous amount of time or money but, for whatever reason, go unnoticed or are ignored? Ms. Waters: The first thing that comes to my mind is equipment. We have the impression that we need a lot of things to cook with. In fact, we need very, very little. I think of equipment as kind of an impediment to touching and tasting and being engaged with our food in a meaningful and inspired way. We tend to feel as though we need a food processor or blender or the right spoon or spatula or knife. We’ve pared it down in this book so that less is more. You don’t need a lot of fancy equipment. 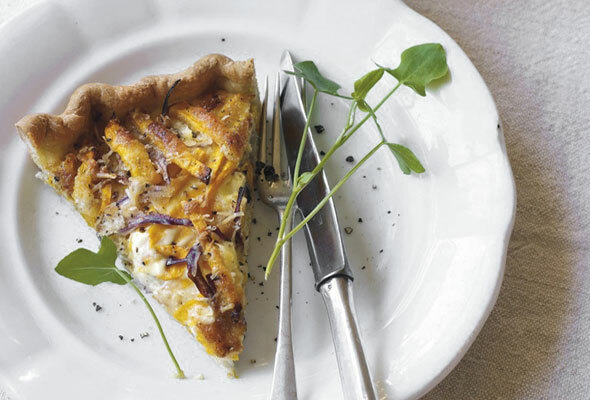 One other thing: It’s so important to go to the farmers’ market, rain or shine. It’s easy to think “It’s raining outside, I can always get it at the supermarket.” That’s not true. There’s something about the aliveness of the food at the farmers’ market that allows you to basically slice a tomato and serve it forth without anything else. Nothing could be less time-consuming—and that’s the whole point. RSR: In the Green Kitchen is filled with personalities who have a tremendous amount of passion for food. In your experience, what has been the most persuasive when dealing with people who aren’t interested in supporting small farmers? Where do we begin in helping make changes in the lives of others around us who simply aren’t passionate about cooking? Ms. Waters: You need to set the table with care. One of the real principles of the Edible Schoolyard is to bring a sort of beauty to the experience, no matter how simple the meal. You can do this by cooking someone something tasty. Then they will listen up and they will ask, “Where did they get that?” And you can tell them about the farmers’ market or, even better, take them there with you. That’s been the experience of Chez Panisse for over 38 years. And we founded Edible Schoolyard based on that same principle. If the children grow it and cook it, they will want to eat it. They all come back for more. They don’t know why. They just do. I think it’s because they feel comfortable there. It’s nature. The edible landscape is, I think, irresistible. They join the table. They like it. They don’t know why they like it. But they like it. You want to be hospitable and generous in those circumstances. We’re all learning together. You don’t need to feel that you have to cook a perfect meal. And you don’t have to hide in the kitchen. The mere act of cooking a meal with your friends is enough. I often just bring the ingredients. Many times we don’t know exactly what we’re going to cook until the last moment. Sometimes there’s pleasure. That’s the best—improvisation once you have the right ingredients. Every day you could eat the same thing and make it differently. RSR: Have you ever considered creating a curriculum of sorts so people who may not be inspired to pick up a cookbook on their own may have a more structured approach to follow? Ms. Waters: That’s a really good idea. We’re going to have a plant sale at the Edible Schoolyard. I plan to go to farmers’ markets around the country. I want to do a cooking show, In the Green Kitchen. However we can receptively communicate a bigger idea about cooking, we’re going to do it. But that isn’t necessarily the only way. I also think a lot of that inspiration and identification with the person who is doing the cooking is important. I hope that we communicated a little of this in the book, showing different types of people, some who are very young, who are from one country or another, or who bring other rituals to the table. Then it becomes a different kind of conversation. RSR: There’s been a lot of talk lately about the phrase “conscious cuisine,” and in the past year alone, several cookbooks have been published that rely on the word “conscious” in the title. Could you share your thoughts on the topic? Ms. Waters: I came to cooking through taste. I found that in looking for that, in finding food that was in season and ripe, I ended up at the doorstep of people who were taking care of the land and who were interested in biodiversity. Calling this “conscious cooking,” to me, makes it sound serious and not delicious. I’m interested in pleasure at the table. I’m interested in that Slow Food movement way, in the right decisions about the stewardship of the land and how to care for the people who grow the food. That naturally brings us to the political decisions that we need to make in order to be responsible in terms of all this. In our book, we’re trying to give a cultural perspective. I’m interested in having the photography of the book be by someone who really cares about the values and really studied photography and really trying to convey the same message. And I’m interested in the typeface of the book, that it’s readable and [has] enough white space and that there’s some air in the pages. This, I think, is what allows people to come into the kitchen more easily. You have to kind of prepare the circumstances of the environment of the book so it communicates and evokes the feeling that you want in the kitchen. You can’t feed people in a book. You’re limited to what you can do in its pages. RSR: It’s been a pleasure speaking with you, Ms. Waters. I so appreciate your time and your…everything these past many years. Thank you for thinking of Leite’s Culinaria. Best wishes on the continuation of your lovely work. 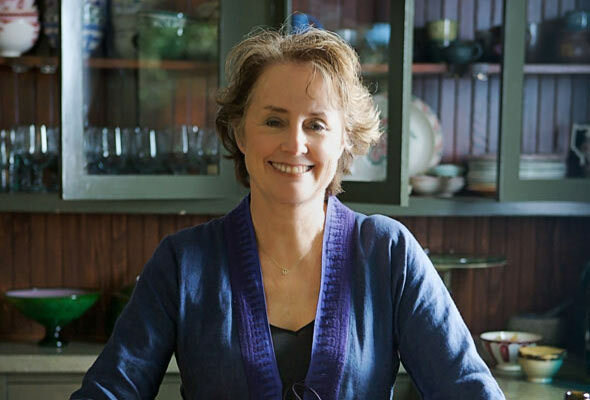 You can get a more in-depth look at Alice Waters’ In the Green Kitchen in our Earth Day | Conscious Cuisine post. Renee, what an honor—and what a graceful interview. Thanks so much for bringing this to print so we could all share in your conversation. I’m now putting two items on my to-do list: a run to the bookstore for “In the Green Kitchen,” and a trip to the greenmarket tomorrow. As for the satsumas . . . I am embarrassed to say I have no idea what they are, but I love anything served with lavender and honey, so yes, I will remedy my ignorance immediately.